p. Comes Bedford. Custos Privati Sigilli. HODIE 1a vice lecta est Billa, for the Preservation and Continuance of Woods. 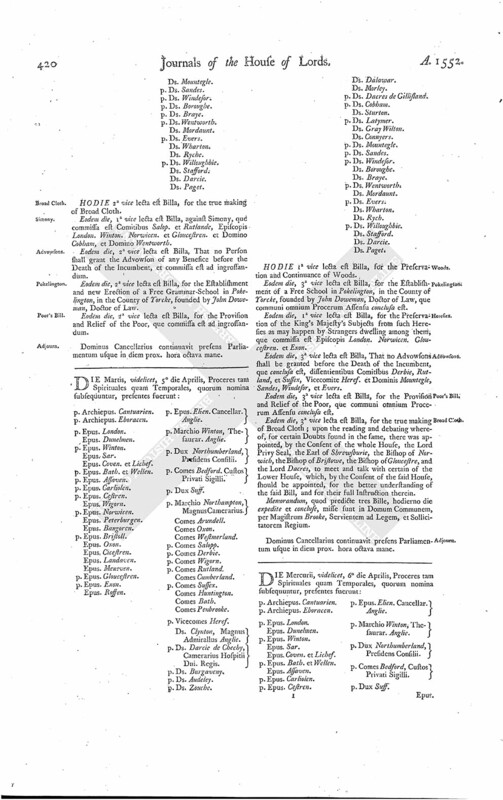 Eodem die, 3a vice lecta est Billa, for the Establishment of a Free School in Pokelington, in the County of Yorcke, founded by John Doweman, Doctor of Law, que communi omnium Procerum Assensu conclusa est. Eodem die, 1a vice lecta est Billa, for the Preservation of the King's Majesty's Subjects from such Heresies as may happen by Strangers dwelling among them, que commissa est Episcopis London. Norwicen. Gloucestren. et Exon. Eodem die, 3a vice lecta est Billa, That no Advowsons shall be granted before the Death of the Incumbent, que conclusa est, diffentientibus Comitlbus Derbie, Rutland, et Sussex, Vicecomite Heref. et Dominis Mountegle, Sandes, Windesor, et Evers. Eodem die, 3a vice lecta est Billa, for the Provision and Relief of the Poor, que communi omnium Procerum Assensu conclusa est. Eodem die, 3a vice lecta est Billa, for the true making of Broad Cloth; upon the reading and debating whereof, for certain Doubts found in the same, there was appointed, by the Consent of the whole House, the Lord Privy Seal, the Earl of Shrewsburie, the Bishop of Norwich, the Bishop of Bristowe, the Bishop of Gloucestre, and the Lord Dacres, to meet and talk with certain of the Lower House, which, by the Consent of the said House, should be appointed, for the better understanding of the said Bill, and for their full Instruction therein. Memorandum, quod predicte tres Bille, hodierno die expedite et concluse, misse sunt in Domum Communem, per Magistrum Brooke, Servientem ad Legem, et Sollicitatorem Regium. Dominus Cancellarius continuavit presens Parliamentum usque in diem prox. hora octava mane.